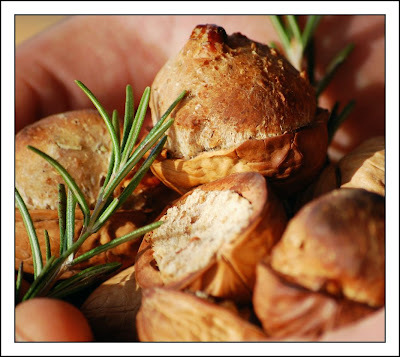 After seeing the recipe for Seeded Flatbread on 101 Cookbooks, my all-times favourite blog, and seeing virtually kilos of walnuts in the pantry, I decided I wanted to try it with walnuts and rosemary, baking the plops of bread inside the empty shells. It worked out just fine, resulting in a nice "head" to tear off and munch right away, and then crack the shell to get at the crunchy inside part. Quite an "interactive" eating! Mix flour with salt and yeast, add water and oil, mix to combine, add rosemary and walnuts, knead to form a smooth dough. Cover and refrigirate overnight. One hour before baking, take the dough out of the fridge and let sit at room temperature. 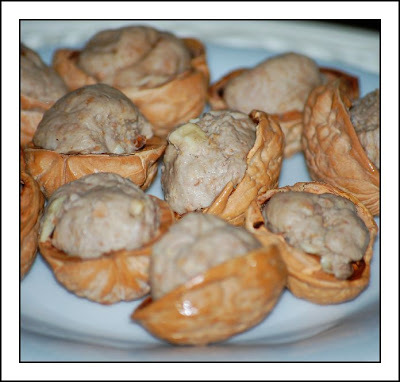 Tear walnut-sized plops of dough and place them inside the empty walnut shells. Bake 220°C for about 15-20 minutes until tops are nicely browned. Let cool a bit and enjoy. Crack the shells using a nut cracker to reach the inside parts. If you don't use all teh dough for the bread bits, shape the remaining dough into a flat disk, add toppings or sprinkle with some seasalt and a bit of oil and bake until crisoy on teh outside but still soft inside. Delicious either way. Makes about 12 bread-bites and a one-portion flatbread.